Elegant façade opening onto street, attractively renovated to provide relaxing, comfortable and spacious accommodation. Pretty courtyard garden with small area of lawn and plants around pool, 7 x 3 x 0.9–1.6m depth, with security fence. The pool benefits from a contra current system for excercising. Sunny terrace with built-in BBQ for al fresco dining. (Neighbours adjacent to garden, but do not directly overlook). Light and airy interior. Entrance hall leading to study with sofa and 2 easy chairs, Satellite TV with free to view UK channels. Stylish ‘cook’s’ kitchen, well equipped with dishwasher, washing machine, fridge, freezer, oven, hob and microwave, and sliding doors to terrace. Large living/dining room, 3 sofas seat 9, with wood burner, DVD and hi-fi. Sliding doors to terrace overlooking pool and garden. Dining area with table and chairs for 8. Sep WC. Feature staircase to first floor. All bedrooms off a wide and sunny corridor. Bed 1: 2 singles, ensuite shower room with WC. Bed 2: 2 singles. Bed 3: double, ensuite shower room with WC. Bed 4: double, ensuite shower room with WC. Bathroom with WC. 2nd floor not for clients use. 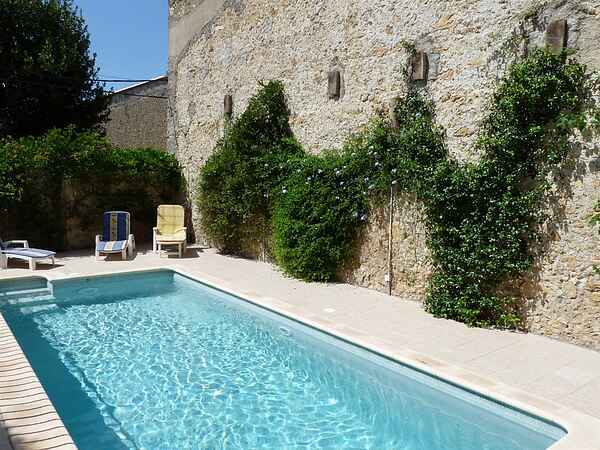 Two travel cots and highchairs available on request Lovely historic village with a superb location within reach of Mediterranean coast, in a with a XII century church, known as “Frog Village” due to its distinctive green bell tower. Local shops and tennis in the village including boulangerie and cafe, with more shops, bustling local market and restaurants at Magalas, 10 min drive. Further shops, antique and food markets, restaurants, nightlife, bar, Roman amphitheatre, golf and horse riding in Béziers 30min drive. Pézenas, a very well preserved historic town with a wide selection of antique and bric-a-brac shops 30 min drive. The little town of Bouzigues, on the shores of the Bassin de Thau offers excellent seafood restaurants, as does the pretty port of Marseillan 45 min drive. . Many activities on offer at the seaside resort of Valras-Beach, 30min drive. International airport: Béziers 15 km, Montpellier 70 km, Carcassonne 110km.